What do you know about Lizards, skinks, and geckos? Where do they live, what do they eat? Do they hibernate or live in warm climates only? Are reptiles nocturnal or diurnal? Are they good to have in the garden? How does one attract them to the garden? Well you might not have this particular reptile in your neighbourhood, but a recent guest presenter sure knows all about them. To attract reptiles to your garden, you need a small pile of sticks, stones, concrete or terracotta pipes in a corner somewhere in the garden. Your reptiles can scurry away from predators into this pile, that doesn’t have to be huge. Plus, they need some stones to bask on when it’s sunny. Much better that they’re out in the garden then in an aquarium as a pet. If you have any questions about a lizard you want identified, why not drop us a line. 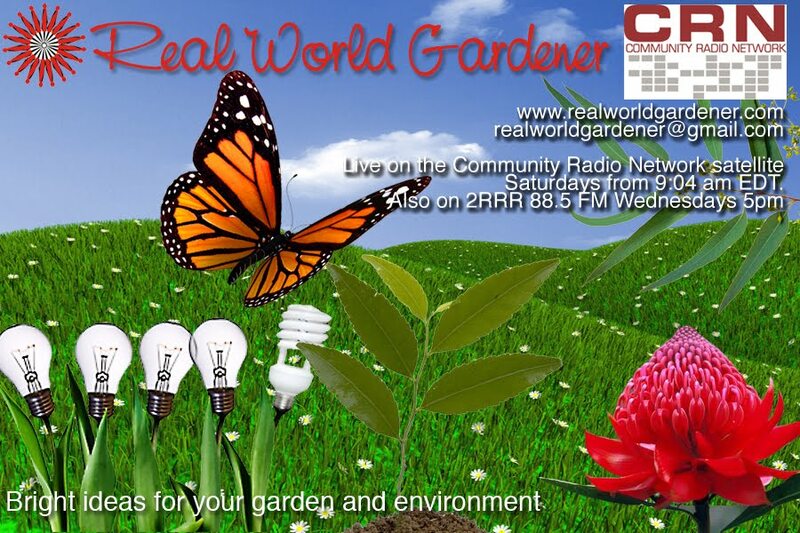 Or send in a photo to realworldgardener@gmail.com or by post to 2RRR P.O. Box 644 Gladesville NSW 1675, and I’ll send you a copy of the Garden Guardians in return..
Grow Your Own Coffee, and do you need 43 beans for every cup of coffee? Coffee beans grow on the Coffea Arabica tree. Coffee belongs in the Rubiaceae family along with Gardenia, Coprosma or looking glass plant, and Rothmannia globosa and Ixora. Coffea arabica is just one type of Coffea originally indigenous to the mountains of the southwestern highlands of Ethiopia. Did you know that because this type of coffee,-Arabica has less caffeine, which gives off a bitter taste, this is the better tasting coffee? Legend has it that a 9th-century Ethiopian goat-herder, named Kaldi, noticing his goats became more energetic when they ate the bright red berries of a certain bush, chewed on the fruit himself. He took them to a nearby monastery where the monks discovered that the burnt beans, when mixed with water, made a drink that gave them energy. Did you know that coffee as a drink wasn’t really known for centuries. Instead, as the pulp of the coffee cherry was sweet, it was first eaten alone or with the seeds (beans). In some places, the green unroasted coffee beans were ground up and mixed with animal fat. Yum! This mixture was then pressed into small lumps and was used by travellers’ for energy. Did you know that Coffee trees were grown in Australia for coffee production in the early 1880’s? Coffee growers here weren’t too bad at it, with arabica beans grown on the far north coast of NSW winning awards in Paris and Rome in the mid 1880’s. Because of the particular micro climatic conditions, Australian arabica coffee is lower in caffeine and is highly regarded for its sweetness and medium body. As there are no serious pests or diseases needing any harmful pesticides, growing your own coffee would be one the most naturally produced coffees of the world. 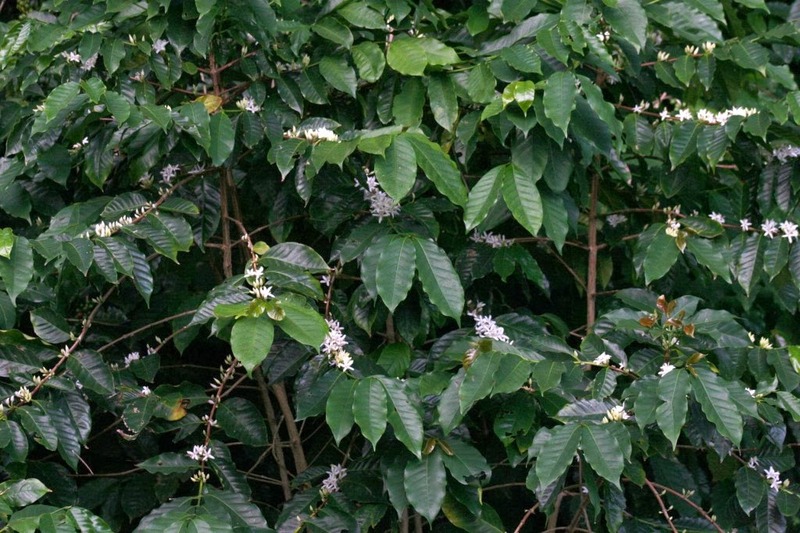 Coffea Arabica is a beautiful tree with glossy green leaves, and jasmine scented white flowers that appear all along the stems. It grows to around 5m, but it can be easily kept to under 2m, as they do in coffee plantations. Then the decorative fruits grow along these same stems, first green then red then turning brown. Inside each fruit, is 2 coffee beans, that look a bit like raw peanuts, in colour and shape. So, do you have a micro climate to grow coffee? Depends on what you’re prepared to do. Coffee dislikes temperatures above 300C and below 70C. It’ll affect tree health, berry quality and growth rate. Sounds like cool temperate districts might get away with it, except for one thing. Coffee doesn’t like frost, especially lower than -20C. Coffee can certainly grow in a pot, so you could wheel it into a sheltered position for winter months. If you’ve got a greenhouse even better. Almost any type of reasonably good soil is O.K. except waterlogged soil and really sandy soils. One other thing, coffee likes acid soils around pH 6. The next thing, it has to rain at the right time of year. That’s the months in winter-spring. 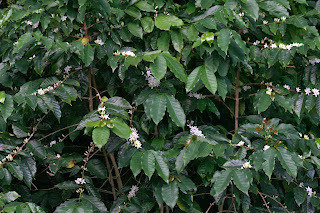 Coffee is like Murraya in that flowering is controlled by rainfall and as little as 8mm will force a new flowering and fruit-set in spring and early summer. After the spring rainfall, there’s a long time over which the berries will ripen. May to November is the norm. Coffee needs a complete fertiliser, like what you’d use on your citrus trees before planting. Late spring is the perfect time to plant your coffee tree. Six weeks after planting apply 100g per tree, and keep doing that every 6 weeks during the warmer months. For country areas, you can buy coffee trees via mail order or online from a nursery in northern NSW. You should get your first crop of coffee beans in about 3 years. Coffee is very tolerant of dry conditions, but if you want a good crop of coffee beans regular watering is needed. When is the coffee bean ready I hear your ask? Only pick the red berries as the green berries downgrade the quality of the final result. Berries don’t ripen evenly, so you’ll have to pick them every couple of weeks, or do what they do in Brazil. Coffee is left on the tree until almost all of the berries have coloured and shrivelled. Then the berries are easily removed in one go. Some say this method doesn’t give you the best coffee. Now, you have to remove the pulp surround the coffee beans-a bit laborious here. The bean is then fermented to remove the sticky mucilage. Like tomato seeds when taking them from a ripe tomato, soak the coffee in water for a few days until bubbles start to appear. When the beans fell gritty, they’re ready for washing. Now, comes the drying-up to 7 days. To tell when they’re ready, the bean has to crack between the teeth. This is called the parchment stage. Yes, you never thought it was going to be this involved. But here it is-the parchment and silver skin have to be removed, leaving the green bean. That’s the bean you have to roast. Before you go, whose going to do that? Volunteer guides at the Botanic gardens have successfully grown and made their own coffee. Coffee contains quite a few vitamins and minerals. B5,2 and B3 and B1 in order of percentage. Coffee also has potassium and manganese. But if you’re into anti-oxidants, then coffee is your best bet to get the most. Do you know of someone, perhaps a relative, whose sight is being affected? The SeeAbility Garden at this year’s Chelsea Flower show was designed to raise awareness of eye health and the effects of sight loss. Four different sight conditions were represented conceptually through distinctive planting and hard landscaping. In the first part of this two part segment, Louise talks about how the sculptures represented different aspects of vision loss. In themselves, these sculptures were lovely to look at and Louise explains how you could construct something similar for your own garden. The seeability garden represents various eye conditions that seriously affect sight. Move your mouse over the garden image on the website to see how it might look if you had an eye condition, and find an explanation on the eye condition below it. If you have any questions about this week’s Design Elements, send it our email address, or just post it. Geranium Big Pink and Big Red. Firstly let’s get out the way the confusion people in general have about Geraniums. Geraniums most people see in hanging baskets, especially in Europe and the UK, are actually not Geraniums, they’re Pelargoniums. True geraniums are more fragile looking, and couldn’t cope with nearly as much sun in Australia, as these Pelargoniums. The name Pelargonium was introduced by Johannes Burman in 1738, from the Greek, pelargós (stork), because the seed head looks like a stork's beak. Pelargonium leaves are usually alternate, and palmately lobed or pinnate, often on long stalks, and sometimes with light or dark patterns. Do you remember the scientific plant names, or are you one for hanging onto common names, like Butterfly bush, honeysuckle, blue sage. All of these names can mean a number of different plants. But what if the nursery industry has decided that one plant’s common name should be its scientific name, and to hell with those botanists. Well, I’m not so sure, because it can be confusing, even if it’s got big, really big flowers. Big flowers, any flowers, on a plant sell well. Why not? Indeed, it’s like buying a posy that lasts for months. So really a Pelargonium but called a Geranium. Why not treat yourself to a big flowered one? Go on. Difference between Geraniums and Pelargoniums. • need of cool climates so most are difficult to grow in extreme heat. • succulent, thick stems that hold moisture to enable them to withstand drought. The erect stems bear five-petaled flowers in umbel-like clusters called pseudoumbels. The flower has a single symmetry plane (zygomorphic), which distinguishes it from the Geranium flower, which has radial symmetry (actinomorphic). The leaves of Pelargonium peltatum, Ivy-leaved Geranium, have a thick cuticle better adapting them for drought tolerance. Pelargoniums don’t cope with frost but if you give them a sheltered position to overwinter, they’ll give an odd flower or two during that colder time. I remember going to piano lessons where the driveway was lined with Pelargoniums. The smell from rain on Pelargonium leaves is very distinctive, and not altogether unpleasant. All Pelargoniums can grow in Cool, Temperate, Arid, Semi-arid areas. Pelagonium x hortorum 'Calliope Dark Red'Extra large bright red semi double blooms from spring to autumn. Heat and drought tolerant.This pelargonium is an ivy-zonal hybrid cross, combining vigorous growing with a spreading, mounding habit that performs well in baskets and large pots or as a spreading plant in the garden / landscape. 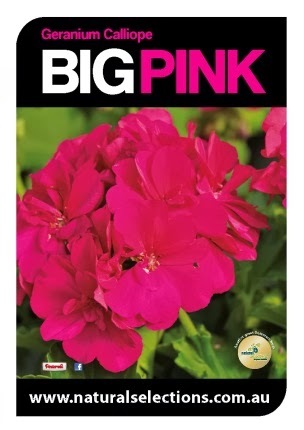 Suitable for full sun or part shade.Grows 30-40cm high by 35-35cm wide. 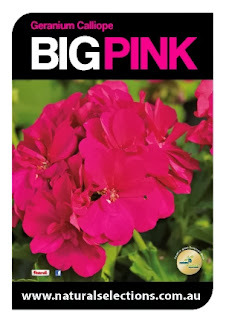 BIG PINKCalliope Geranium Neon pink flowers.Mounded semi double, semi trailing habit. Blooms spring summer and autumn.Plant in well drained soil. Adequate watering is required until established. Apply a slow release fertiliser in spring. Remove spent flowers to encourage new blooms. Prune to maintain shape in autumn. The maintenance of the coffee plants is very difficult it may not be a good idea.But still would like to grow coffee beans at home.